Since winter break ended, I have been hearing stories of major events that took place during the holidays. To my surprise, there were quite a few engagements and pregnancies! That’s right. My very own friends are starting to tie the knot and contribute to the world population. It’s hard for me to wrap my head around this because I’m still convinced boys have cooties. Back when I was thirteen or so and didn’t stay up past 11pm (something I should confess I still don’t do), I remember thinking about my age in 2015. “Wow, so I’ll be twenty-three then!”. In another ten years, I’ll be thirty-three! Then soon after, forty-three! At that point, I might have a daughter who will probably be experimenting with makeup and complaining to me about boys and maybe also, a son who wants to take the car out every night and is having a hard time choosing between Stanford and UC Davis (it’s a tough choice)! Phew, getting a little ahead of myself. I’m still wondering about the cooties. As an adolescent, I was under the impression that life really started after you get married and have a family, and everything you do before that is just preparation for that future. Eventually it occurred to me that this is life. There is no waiting for anything to happen. In other words, live in the present. Cliche I know, but there’s no better way of saying it. It doesn’t translate to “YOLO” or doing something wild like leaving everything behind to live with gorillas in an African rain forest, but I think it does mean you don’t need to wait until the end of that stressful quarter, or until you quit that uninspiring job, or until you fall in love to be happy. In conclusion, don’t worry, be happy. Foodwise, something that makes me pretty happy is fried rice. This incredibly quick and easy fried rice is a dish Papa Choi would often make for us as kids. With just one bite, I’m transported back to my childhood. My siblings and I loved it so much, mostly because of the salty, delicious chinese style sausage. As an adult, I still love and crave it. 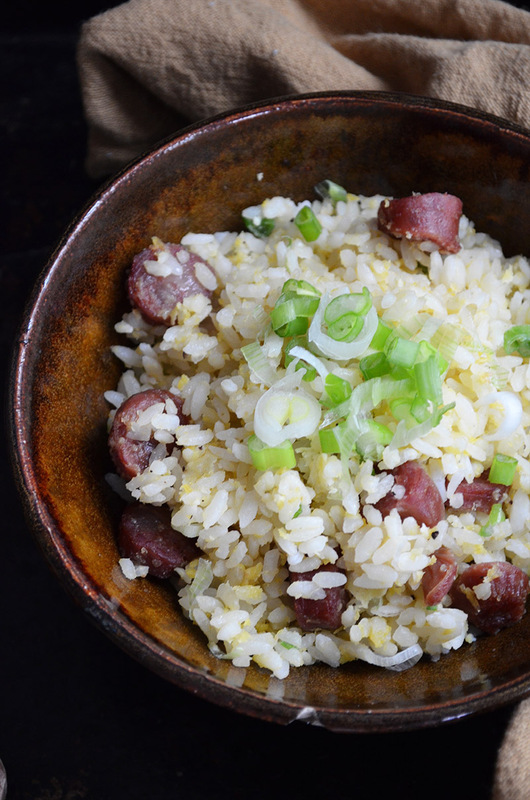 If you have rice, eggs, chinese style sausage, and 15 minutes, you can have this delicious fried rice. It makes great leftovers, and if anyone is wondering what I’ll be having for lunch these next three days, just scroll down. In a medium mixing bowl, whisk together the eggs, 1 teaspoon soy sauce, salt, pepper, and sugar, then set aside. In a large nonstick skillet, heat up the oil over medium heat. Add the chinese sausage and cook for about 3 minutes, stirring constantly. Add the rice, and use a spoon to break up any clumps. Cook until the rice is clump-free and soft, about 2 minutes. Pour in the egg mixture, and turn up the heat to medium-high. Constantly stir until the egg is mostly cooked, then add the remaining 1-2 teaspoons soy sauce (depending on your taste) and green onions. Stir for another minute, remove from heat, and serve immediately. This entry was posted in Entrees, Sides and tagged Chinese, Chinese style sausage. This sausage fried rice looks delicious! Pinned! 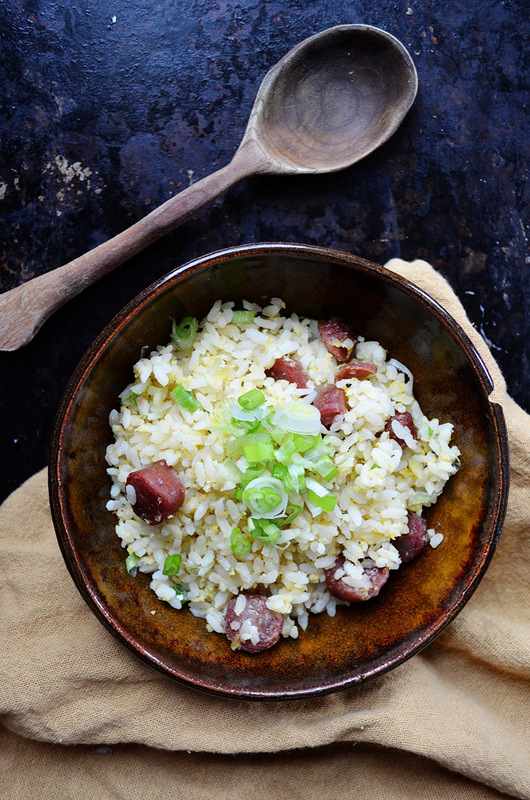 I love the sweet taste of Chinese sausage, sometimes I put it in white rice when I’m steaming to flavor the rice too. Your fried rice looks amazing! I totally know what you mean by seeing friends get engaged and married! I feel that too every time I log into facebook. When I was really stressed as an undergrad, I would tell myself that I was lucky to have such stresses and to be thankful for being in school! It’s not easy to be cognizant of it all the time, but we do have so much to be thankful for! I’m nearing 30 and I still think its strange that my friends are married/getting married. Not to mention friends that already have kids! I think we’re all still too young. I hardly feel like an adult yet. I agree! I still can’t believe some of my friends have kids, especially since I still feel like one! This looks delicious! My husband makes the best fried rice, I need to nudge him to make your recipe. 😉 Don’t rush marriage or kids. I was married at 26. I don’t regret it at all, I love the man dearly. But I would say to wait, figure life out, figure yourself out. Everything else will fall into place. Have a wonderful weekend! Thank you for the wonderful advice. Figuring out life, that’s first on my list! I hope you have a nice weekend too! I love fried rice, this one looks delicious! I’ve only made it myself a few times though. Need to try your version! Yum, love fried rice! Makes the perfect east weeknight or anytime meal! This looks delicious! Connie, this looks sssooo comforting! I can imagine myself curled up under a blanket with a big bowl of this steaming rice and a nice cup of warm tea! Yummo! I love fried rice too, but I’ve never made it! I’ll have to start with yours! I just got married right before I turned 30. Waiting until I found someone that I was sure about was worth it. Marriage (and kids) is one of those things you definitely don’t want to rush! Love your take on life! Thanks Lindsey! It’s so easy; you could do it in your sleep..almost. (: And I totally agree – no rushing! You know, I grew up eating this rice dish. It reminds me of my grandmother because she likes preparing this for me. My grandma is no longer with us, but this brings back so many good memories! Thanks for sharing! Hi Jen!! Thank you for your sweet compliment! I just visited your blog, and I definitely feel like we are on the same wavelength when it comes to food!! I am so happy this dish brings back good memories for you. It does for me too!